Oh, sh..t.. I just read that sparkling wines are excluded for this Wine Blogging Wednesday. Well, no time to change my posting or try another wine. So be it. Better luck next time and sorry to the people at El Bloggo Torcido, this month’s host to Wine Blogging Wednesday. Wine for breakfast is the theme for the 53rd edition of Wine Blogging Wednesday. And I knew immediately which wine to choose: since our visit to Barcelona two weeks ago, I’m hooked on and fascinated by cava! I did not know there were so many different cava’s available. In the Netherlands, only Freixenet and Codorniú seem to be around. But in Barcelona, we have tasted five different kinds in three days, all NOT from the big two. I learned that those two companies, together with five others, control 80% of the world cava market. But there are 263 other, smaller cava producing companies in Catalonia and other parts of Spain! For this WBW I was determined to find a good cava from one of the 268 companies we hardly see in my own country. This didn’t turn out as easy as it looked, alas; besides trying to find a cava other than Freixenet or Codorniú, I also wanted a semi-seco one! Why? Because a few weeks ago, for the first time we had a wine for breakfast. I then chose a Crémant de Bourgogne, which turned out to be too dry, too yeasty for a combination with fresh fruits and sweet breakfast items. In a semi-seco, the dosage contains just a little more sugar, thereby giving the sparkling wine just that little more roundness and fruitiness that it needs to go with fresh fruit and a slice of sweet raisin bread with butter. My search took me to several liquor stores and supermarkets in my vicinity, but all cava’s were Brut. I searched the websites of close-by wine speciality shops and found again only Bruts. I visited one wine speciality shop I hadn’t been to before and found an interested cava ‘Zeta Reserva’ which I bought, but which is a Brut also and will remain closed till another occasion arises. In the end, I found one semi-seco, at my regular supermarket. Guess which one… Yes, Freixenet Carta Nevada. Well, alright then, this will by my breakfast wine for WBW 53. I was completely right about wanting to find a semi-seco: this wine combined very well with the fresh fruit (kiwi, grapes, apple, pear) and the sweet raisin bread. The colour is pale yellow, the bubbles nice and tiny, with little strings of pearls in the glass. In the nose a hint of toast, but not to much, and much fresh fruit. I detected even some slight minerality and a touch of sweet-sour apples. This is a very agreeable breakfast wine, especially since it’s alcohol percentage is only 11%. I am satisfied with the results, but my search for cava’s in the Netherlands other then from the big two will continue. My readers on Wijnkronieken will hear more on Spain’s most famous sparkling wine this year! More information on cava on the internet: check out Catavino and their special Newsletter. I hope you are included in the roundup, especially because of all the time and effort you put into finding a “brutless” offering. 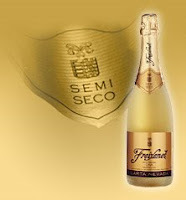 I’ve often wondered how a sparkling wine would fare with breakfast and am now anxious to try a semiseco cava with fresh fruit…but it’d probably have to be on the weekend.